In power transformers and in electric equipment in general, oil is used to insulate and to cool. The use of various types of oil for power systems is governed by internationally recognized standards. The purpose of the uniform standards is to keep electric power equipment and systems in good working condition. Of course, this depends on the performance characteristics and general condition of the transformer insulating oil. Any business that uses oil must be concerned with the issue of oil storage and disposal. This is especially important for the energy sector and the electric power generating and transmission industry. Transformer insulating oil may come from the factory or substation in more than one condition. Even when the oil is fresh from the manufacturer, it is possible that undesirable amounts of moisture and gases accumulated in the oil during transportation. Transformer oil delivered from the manufacturer and purified to comply with the performance standards is usually stored in liquid storage tanks at maintenance facilities. Regardless of the condition of the oil, whether it is new or used, it must be stored in a safe and leak proof container. For the purposes of fire safety, the manufacturer must strictly adhere to national safety and fire prevention standards. The actual method of storage however, and the availability of specially equipped buildings, tanks, and service equipment can vary greatly depending on location, climate and country. A wide range of different oil storage tanks can be found in the local and international markets. 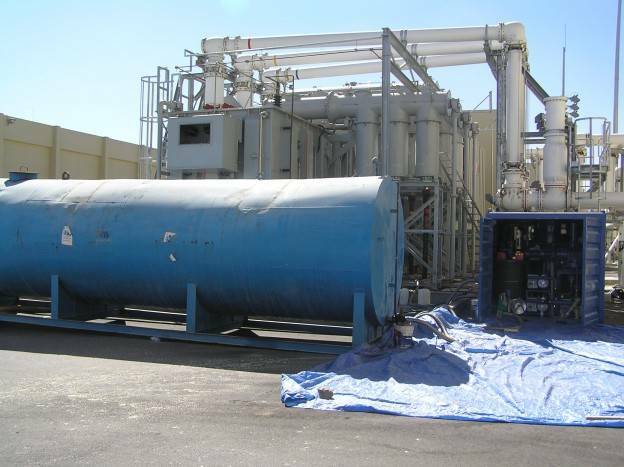 There are soft tanks that can drain and store oil more quickly reducing transformer servicing and possible downtime. But, these types of tanks are better suited for transporting oil to interim storage facilities. For actual storage of liquids, the most widely used tanks are vertical cylindrical tanks that are equipped with leveling quality controls, agitation systems, temperature sensors and built-in maintenance systems. A vertical insulated tank is made of steel with heated circulation pipes below the surface. For tank maintenance and servicing, a ladder is mounted on the tank with a protective rail along the top. Temperature is monitored by a thermistor installed in the bottom of the tank that displays the temperature on the tank’s control panel. The heat exchange system is made of an array of pipes and insulation jackets.